Over the last few weeks, we’ve been pleased to host Johanne, a third year student from Norway. 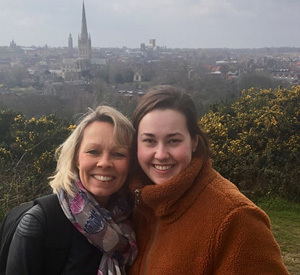 While she was here, Johanne worked in the community services team at St Martins and joined some teaching opportunities at the University of East Anglia. Sitting now at Café Britannia thinking back on the experience I’ve just had – it`s been a journey! Café Britannia is a café that works with the prison in Norwich, giving people who is coming out of prison an opportunity to get back on their feet by cooking and serving people. My journey started a bit over ten weeks’ ago when I arrived at Norwich a late Sunday night. This was the first time I met Susanne in person. (Susanne Lindqvist is Professor in Interprofessional Practice at UEA.) She picked me up at the train station and took me to the family that I was going to stay with. I couldn’t have asked for a better start. Over the weeks I have experienced a lot. Being surrounded by strong resourceful people have given me the opportunity to make the most of the internship. Not only have I seen what St Martins have to offer, I have also had the opportunity to experience other health services in Norwich, like joining the home assessment team from Hellesdon (a hospital for the mentally unwell). Susanne asked me just now, what I have learned from this experience. The answer to that is, I have learnt a lot! I have learnt about how the health system works in England, how St Martins fit into that, as a private organisation, and how this organisation is built up. I also have to say that when it comes to my personal evolvement, I have gained a broader view on how complex it is working with people (service users) in this field. I experienced meeting people that are in different places in their life, mentally. Meeting them, at the point where they are at, which often is very difficult circumstances, helped me develop my social skills. This also included my inter-personal skills such as staying calm, being polite, respectful and so on. Meeting people at St Martins, many of whom lack in their inter-personal skills, showed me that the smallest things can make a big difference to them. I could go on for a long time, but to put it briefly if I were given the opportunity to do this all over again – I would – without thinking twice about it! Susanne said, “It is important for us to encourage our students to see different communities, experience various situations and meet a whole range of people from ‘all walks of life’.